The Danish Wind Energy Association represents companies, organisations, cooperatives and private people with an interest in or ownership of wind turbines. Its more than 30.000 members produce some 75% of all wind power in Denmark. Combined the members produce one third of Denmark's electricity. E.ON Climate & Renewables is responsible for E.ON’s industrial-scale renewable energy activities. EC&R develops, builds and operates large renewable energy assets in Europe and North America. Since its formation in 2007, EC&R has invested more than €10 billion in renewable energy. The company currently operates about 5.3 GW of renewable generation capacity and EC&Rs technology portfolio covers onshore and offshore wind, as well as utility-scale photovoltaic (PV) solar power and energy storage. Eneco is an international renewable energy company. With 3500 employees we operate in the Netherlands the UK Germany France and Belgium. In addition to energy production purchasing and trade Eneco supplies energy to over two million companies and households. Our mission is to make ‘sustainable energy for everyone’ a reality. Envision Energy's business covers designing and manufacturing smart wind turbines software services of smart wind farms diagnostic and technical services integrated project management services asset management services and energy investment services etc. We are committed to becoming the most competitive and respected smart energy management expert. Iberdrola is Spain’s leading energy group one of the top five electricity companies worldwide and global leader in wind energy. With 30 million customers and founded on a sustainable growth strategy we are working towards providing the cleanest energy on the planet. We are an engineering and consultancy company specialized in control and management systems with over 30 years of experience in the energy sector. Throughout our existence we have built close relationships with some of the main international companies in the Renewable Energy sector. With offices in Spain, UK, US, Mexico, Chile and Brazil, our management systems are found in more than 1.523 renewable energy installations and are used in the operation of more than 25 GW around the world. Illinois Tool Works Inc. (ITW) is an American industrial group that has existed for more than 100 years and today operates over 800 businesses located in 52 countries worldwide. ITW Performance Polymer's product portfolio includes ultra high performance grouting and adhesive solutions. 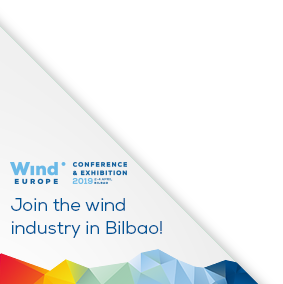 The globally represented Lafert Group is committed to supporting the wind industry with standard and customised motor technologies. Lafert has years of experience in supplying global players in the wind industry. Lafert offers both asynchronous and synchronous permanent magnet motors applied inside industrial automation, energy-saving applications and renewable installations. Navigant’s global Energy practice provides consulting and research services for energy companies, government organizations, NGOs and foundations, large corporations, product manufacturers, technology companies, and investors in areas such as climate strategies and policies, energy policy and implementation, sustainability, market structures and pricing, business and operational strategy, go-to-market and product development strategy, business models and partnerships, energy efficiency and demand-side management, emerging technologies, renewables, urban energy and distributed energy resources, transmission, and grid modernization. We have practical technical and commercial experience in developing, financing, constructing and operating offshore wind farms and combine this with deep knowledge and experience about wind resources and energy yield.